Jimmy Muitt fired a hat-trick at AFC Sudbury to keep Bognor one point ahead of Havant in the race for the Ryman premier title. Muitt's treble had the game won in Suffolk well before the end and Darren Budd was on target too as Jamie Howell's team won 4-0 against the ten-man hosts. Havant's 2-0 win over Tonbridge keeps them just a point behind and the sides each have three games to play - including the Easter monday showdown between the title bidders at West Leigh Park. In the Southern Combination, Bosham are the heroes of the hour after beating Roffey 2-0 to become champions of division two. Closest rivals Jarvis Brook's 0-0 draw with Sidlesham means the Robins can't be caught and the champagne was out at Walton Lane as the club celebrated their third trophy in three seasons. 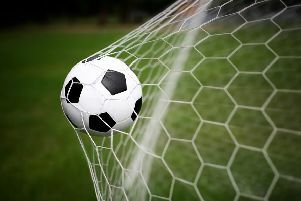 In the premier division Chichester City had Lorenzo Dolcetti's hat-trick to thank for a 3-1 win at Horsham YMCA that kept up their chase at the top. Pagham lost 2-0 at home to Crawley Down Gatwick, while in division one Selsey were defeated 3-1 at home to Saltdean. In local rugby, it's looking bleak for Chichester after they lost 30-24 in controversial circumstances at Colchester - having a try disallowed late on that looked like it should have stood. They now need to win their final game, at home to Westcombe Park in a fortnight, and hope Sutton lose their last one. Get all the local action in the Observer, out on Thursday.